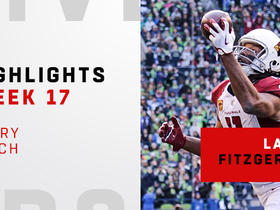 Fitzgerald caught eight of 12 targets for 102 yards and a touchdown during Sunday's 18-15 win over the 49ers. Fitzgerald (hamstring) practiced fully Thursday, Darren Urban of the Cardinals' official site reports. Fitzgerald (hamstring) returned to practice Thursday, Darren Urban of the Cardinals' official site reports. Analysis: It's unclear how many practice reps Fitzgerald was able to handle, but he's on a similar path to previous weeks, when he was cleared either by the end of the week or just before kickoff. After posting three consecutive 100-catch, 1,000-yard seasons, the 35-year-old wide receiver was due for some regression in 2018. However, the combination of a lingering hamstring issue and the Cardinals' quarterback situation has contributed to a dismal campaign to date. 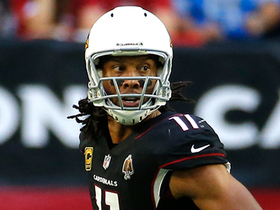 Fitzgerald didn't practice Wednesday due to a hamstring issue, Darren Urban of the Cardinals' official site reports. Analysis: While the Cardinals gave Fitzgerald an injury designation, his absence likely was more of a veteran day off than anything. Look for him to return in some capacity the next two days as he prepares for a significant workload yet again Sunday against the 49ers. On the season, Fitzgerald has paced the Arizona receiving corps by playing 86.9 percent of the team's offensive snaps. Fitzgerald brought in four of eight targets for 40 yards and a touchdown in the Cardinals' 45-10 loss to the Broncos on Thursday. Fitzgerald (back) doesn't carry an injury designation into Thursday's game against Denver, Darren Urban of the Cardinals' official site reports. Analysis: Listed as a limited participant the previous two days, Fitzgerald was upgraded to full participation for Wednesday's walk-through practice. Fitzgerald should be fine to handle his usual complement of snaps, but he has yet to get anything going this season and will now draw a tough matchup in the slot against Broncos cornerback Chris Harris. 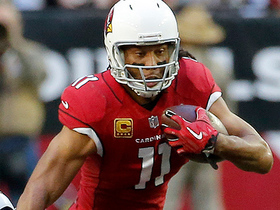 Fitzgerald (back) was limited at Tuesday's practice, Darren Urban of the Cardinals' official site reports. Fitzgerald (back) was listed as a limited participant on the Cardinals' estimated injury report Monday, Darren Urban of the team's official site reports. Analysis: Fitzgerald experienced the usual restrictions on his reps at Monday's walk-through. On a short week, it wouldn't surprise if this remains the reality for Fitzgerald, who along with the rest of the Cardinals' skill-position players is preparing for Thursday's matchup with the Broncos' 11th-ranked pass defense (242.5 yards per game). Fitzgerald caught five of eight targets for 39 yards during Sunday's 27-17 loss to the Vikings. Fitzgerald (hamstring/back) doesn't have a designation for Sunday's contest in Minnesota, Darren Urban of the Cardinals' official site reports. Analysis: After handling every practice rep Friday, Fitzgerald appears to be the healthiest he's been since Week 2, when he initially suffered a strained hamstring. On Sunday, he'll aim to exploit a Vikings defense that ranks 25th against the pass this season (278.6 yards per game). Fitzgerald (hamstring/back) practiced on a limited basis Thursday, Darren Urban of the Cardinals' official site reports. Analysis: As he's done since straining his hamstring Week 2, Fitzgerald followed no practice Wednesday with individual drills Thursday. The next stage of his regimen has been another limited listing to wrap up the week. Whether he upholds this standard or progresses to a full session, there's little question Fitzgerald will be available Sunday at Minnesota, who owns the 25th-ranked pass defense this season (278.6 yards per game). Fitzgerald (hamstring/back) returned to practice Thursday, Scott Bordow of The Athletic reports. Analysis: Fitzgerald is merely following the practice schedule imposed upon him since injuring his hamstring Week 2. Expect him to log a limited practice, per usual, unless his health has improved enough for an uncapped session. Fitzgerald was held out of practice Wednesday with hamstring and back injuries, Darren Urban of the Cardinals' official site reports. Fitzgerald (hamstring) didn't participate in the portion of Wednesday's practice open to the media, Darren Urban of the Cardinals' official site reports. Analysis: With a hamstring injury in tow since Week 2, Fitzgerald has settled into a restricted practice regimen. Per Urban, coach Steve Wilks labeled the wideout as "day-to-day" for the week, which clouds Fitzgerald's availability for Sunday's game against the Vikings. Fitzgerald hasn't displayed any sign of improved health, but he could upend the prevailing opinion with a full practice Thursday or Friday. 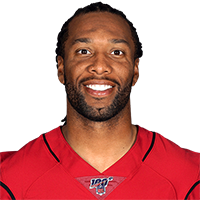 Coach Steve Wilks said Fitzgerald (hamstring) is considered "day-to-day" this week, Darren Urban of the Cardinals' official site reports. Analysis: As Fitzgerald has been for much of the season due to a hamstring injury suffered Week 2. Even so, he leads all Cardinals wideouts in offensive snap share at 84.9 percent. Clearly, the workload is evident, but he hasn't surpassed 35 yards receiving or scored in a given game with his health compromised. Fitzgerald (hamstring) caught two of three targets for 35 yards in Sunday's 28-18 win at San Francisco. Analysis: Fitzgerald's production has been modest, to say the least, over the last four games, with just 10 receptions for 100 yards during that span. Part of the blame could be placed on his lingering hamstring injury, but the state of the Cardinals' offense is not helping either. The veteran wideout will try to get on track in Week 6 at Minnesota. Fitzgerald (hamstring) is active for Sunday's game in San Francisco. Analysis: Fitzgerald has made a mockery of the 49ers defense the last three seasons, posting two 100-yard performances and reaching the end zone five times in six contests. With a hamstring injury in tow, the 35-year-old will be hard-pressed to uphold that standard considering his meager output (8-65-0 on 12 targets) the past three outings. Fitzgerald (hamstring) will play Sunday against the 49ers, Adam Schefter of ESPN reports. Arizona and San Francisco kick off at 4:25 p.m. EDT. Analysis: Fitzgerald has been bothered by the hamstring injury for the last three weeks, but managed to suit up every week, so it's not surprising he'll play. However, he has just eight catches for 65 yards over those three games, so it might be wiser for Fitzgerald to take a week off. Fitzgerald (hamstring) is listed as questionable for Sunday's game in San Francisco, Darren Urban of the Cardinals' official site reports. Analysis: A limited practice participant throughout the week, Fitzgerald should be fine to continue playing through his hamstring injury, even if it saps some of his effectiveness. He has caught just eight passes for 65 yards in three games since Week 1. Fitzgerald (hamstring/back) was a limited practice participant Thursday, Darren Urban of the Cardinals' official site reports. Analysis: Per usual, Fitzgerald has responded with a limited practice following a DNP as he recovers from the hamstring injury that he initially injured Week 2. There's been no indication he's in danger of missing his first game since the 2014 season, but owners should check out Friday's injury report to get a sense of his potential to play Sunday at San Francisco. Fitzgerald (hamstring/back) practiced during the part of Thursday's practice open to the media, Scott Bordow of The Athletic reports. Analysis: The Cardinals have capped Fitzgerald's practice reps since he sustained a hamstring injury Week 2, holding him out in the first session of the week before allowing him to participate in a limited capacity the next two days. However, the maintenance hasn't exactly translated to the box score -- he boasts five catches for 37 yards on nine targets the last two games -- as the wideout continues to deal with less-than-ideal quarterback play. Fitzgerald (hamstring/back) was a non-participant at Wednesday's practice, Darren Urban of the Cardinals' official site reports. Analysis: In the middle of his third week contending with a hamstring injury, Fitzgerald is now dealing with a back concern as well. The Cardinals will continue to take a cautious approach with the veteran wideout, likely capping him at limited practices Thursday and Friday yet again. There shouldn't be too much worry about his availability for Week 5 though, as he's missed only six games in 14-plus seasons and just two since the start of the 2008 campaign. Fitzgerald (hamstring) wasn't sporting a helmet during the portion of Wednesday's practice open to the media, Darren Urban of the Cardinals' official site reports. Coach Steve Wilks said Monday that he considers Fitzgerald (hamstring) to be day-to-day, Josh Weinfuss of ESPN.com reports. Analysis: Fitzgerald caught just five passes for 37 yards while playing through his hamstring injury the past two weeks, but he still managed to log snap shares of 96 and 97 percent. He'll likely show up on the injury report once again as the Cardinals prepare for a Week 5 game in San Francisco. Fitzgerald secured three of seven targets for 28 yards during Sunday's 20-17 loss to the Seahawks. Fitzgerald (hamstring) is listed as active Sunday versus the Seahawks, Josh Weinfuss of ESPN.com reports. Analysis: Per Adam Schefter of ESPN, Fitzgerald's hamstring is "nowhere near 100 percent," but he'll tough it out for the second game in a row. There's a chance Fitzgerald will be used as a decoy to draw attention away from the Cardinals' other pass catchers, namely David Johnson, Christian Kirk and Ricky Seals-Jones. Fitzgerald (hamstring), who is listed as questionable for Sunday's game against the Seahawks, will be able to play, Adam Schefter of ESPN reports. A source told Schefter, however, that Fitzgerald is "nowhere near 100 percent" and "probably shouldn't have played last week." Fitzgerald (hamstring) is listed as questionable for Sunday's game versus the Seahawks, Gregg Bell of The Tacoma News Tribune reports. Analysis: Fitzgerald logged the exact same practice regimen (DNP/LP/LP) for a second consecutive week, so he should be good to go Sunday. He's coming off one of the least productive performances of his illustrious career -- two catches for nine yards on two targets -- but he'll have the potential benefit of an upgrade at signal-caller. Rookie Josh Rosen has replaced the ineffective Sam Bradford as the starter, which could be a boon for Fitzgerald. Fitzgerald (hamstring) was a limited participant at Thursday's practice, Darren Urban of the Cardinals' official site reports. Fitzgerald (hamstring) was present at the open part of Thursday's practice, Josh Weinfuss of ESPN.com reports. Analysis: Fitzgerald similarly was active during that portion of practice Wednesday but without a helmet in tow, resulting in a DNP. On Thursday, he was donning a helmet, which is as good of a sign as any that he'll be a participant in certain drills. His activity level will be confirmed upon the release of the Cardinals' second injury report of the week. Fitzgerald (hamstring) was listed as a non-participant on Wednesday's injury report, Darren Urban of the Cardinals' official site reports. 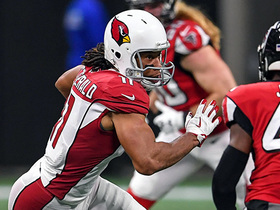 Fitzgerald took part in individual drills without a helmet during the portion of Wednesday's practice open to the media, Darren Urban of the Cardinals' official site reports. Analysis: In seasons past, Fitzgerald received a regular veteran's day off from the first practice of each week. On this occasion, though, he may be hindered by the hamstring injury that plagued him a week ago. Wednesday's injury report will reveal whether the hamstring issue was responsible for his absence. Fitzgerald (hamstring) caught both of his targets for just nine yards in Sunday's 16-14 loss to the Bears. Fitzgerald (hamstring) is listed as active Sunday against the Bears, Darren Urban of the Cardinals' official site reports. Analysis: The Cardinals contained Fitzgerald to two limited practices as he tended to a minor hamstring injury this week. The management of his health has yielded the desired result, but he'll reenter what has been the least dynamic offense in the NFL through two games. If Sam Bradford can start to put it together, though, Fitzgerald could be an effective option against a Bears defense that has allowed 10.5 YPT and four touchdowns to wide receivers in 2018. Fitzgerald (hamstring), who is listed as questionable on the official injury report, will play in Sunday's contest versus the Bears, Adam Schefter of ESPN reports. Analysis: Fitzgerald had a pair of limited practices this week, but this report adds to previous expectations that he'll be able to play. However, this report isn't official so fantasy owners will want to watch his status before Sunday's 4:25 p.m. EDT kickoff. Fitzgerald (hamstring) is listed as questionable for Sunday's contest versus the Bears, Scott Bordow of The Athletic reports. Analysis: Fitzgerald managed a pair of limited practices to close out Week 3 prep, but his minor hamstring injury will hang over his head until 90 minutes before Sunday's 4:25 PM ET, when he's expected to be named active. As the sole Cardinal to have more than 40 receiving yards this season -- 104 to be exact -- he's the clear-cut No. 1 option in the NFL's worst pass offense (114 yards per game) after two games. 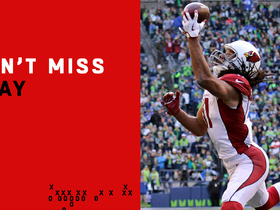 Fitzgerald (hamstring) practiced in a limited capacity Thursday, Darren Urban of the Cardinals' official site reports. Analysis: Pulled from the Cardinals' Week 2 loss to the Rams with a minor hamstring injury, Fitzgerald has so far followed a DNP/LP practice regimen, with Thursday's appearance building confidence in his ability to suit up Sunday versus the Bears. His relative ironman status is unquestioned -- he's missed just two games since the start of the 2008 campaign -- so active status Week 3 seems likely, even if he's listed as questionable on Friday's injury report. Fitzgerald (hamstring) returned to practice Thursday, Scott Bordow of The Athletic reports. Analysis: Fitzgerald came out of Sunday's destruction at the hands of the Rams with a hamstring injury, which forced an absence from Wednesday's session. Afterward, coach Steve Wilks said Fitzgerald is slated to suit up Sunday against the Bears, and Thursday's appearance is a step in that direction. Fitzgerald's activity level will inform whether he's likely or almost certainly playing Week 3. 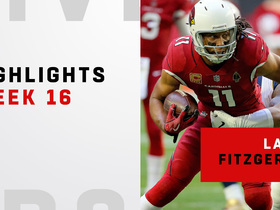 Fitzgerald (hamstring) was held out of practice Wednesday, Darren Urban of the Cardinals' official site reports. Analysis: In the midst of a media session Wednesday, head coach Steve Wilks told Urban that Fitzgerald was a limited practice participant. However, the wide receiver didn't actually take part in drills, which was forecast by his lack of activity in the open part of practice, per Kyle Odegard of the team's official site. While Wilks added Fitzgerald is slated to suit up Sunday against the Bears, the 35-year-old would allay concerns about his availability with an appearance Thursday and/or Friday. Cardinals head coach Steve Wilks said Fitzgerald (hamstring) was limited at Wednesday's practice and is expected to play Sunday versus the Bears, Darren Urban of the team's official site reports. Analysis: During the media-access portion of practice Wednesday, Fitzgerald was contained to stretching, but he must have fit in some reps behind closed doors. He hasn't missed a game since the 2014 season, so all signs are pointing toward an appearance Sunday against Chicago's 18th-ranked pass defense. With no Cardinals player aside from David Johnson making an impact in the passing game this season, expectations should be tempered for Fitzgerald. Fitzgerald (hamstring) took part in stretching but wasn't active during the open portion of Wednesday's practice, Kyle Odegard of the Cardinals' official site reports. Analysis: Fitzgerald typically receives a veteran's day off or is limited with a non-injury during the first session of each week, but his hamstring concern throws a wrench into his current status. His outlook for the Week 3 matchup with the Bears will become clearer once Wednesday's injury report is posted. Coach Steve Wilks said Fitzgerald (hamstring) will be "monitored" in practice this week, Darren Urban of the Cardinals' official site reports. Analysis: After Sunday's 34-0 loss to the Rams, Fitzgerald told Kent Somers of The Arizona Republic that he'd been tending to a hamstring injury for about a week to 10 days. Fitzgerald aggravated the issue Sunday when he made a leaping grab in the third quarter and will no doubt be a participant in the rehab group during Week 3 prep. Coach Steve Wilks believes Fitzgerald's hamstring injury is minor, Josh Weinfuss of ESPN.com reports. Analysis: Despite the initial optimism, Fitzgerald will require further evaluation Monday after exiting in the third quarter of Sunday's 34-0 loss to the Rams. He was deemed questionable to return shortly after his exit, and the Cardinals had no incentive to bring him back once the game was out of reach. 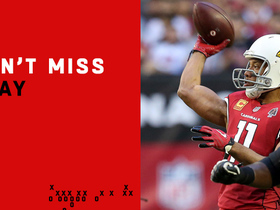 Fitzgerald finished with three catches for 28 yards on five targets as the Cardinals got blown out for a second time in as many weeks. Arizona hosts the Bears in Week 3. Fitzgerald is questionable to return to Sunday's road game against the Rams due to a hamstring injury, Kyle Odegard of the Cardinals' official site reports. Analysis: When he departed in the third quarter, Fitzgerald had just three receptions (on five targets) for 28 yards to his name. He's been a modicum of health and conditioning during 14-plus seasons, missing six games overall and just two (both in 2014) since the start of the 2008 campaign. There's no telling if the current concern will impact his practice reps as the Cardinals prep for a Week 3 matchup with the Bears, but Wednesday's injury report will give the first indication of his potential to play. Fitzgerald caught seven of 10 targets for 76 yards in Sunday;s 24-6 loss to Washington. Analysis: Fitzgerald was the only pass catcher to do anything at all, as quarterback Sam Bradford threw for just 153 yards without any touchdowns. The veteran wideout should continue to see a large number of targets each week, although Arizona's offensive performance Week 1 is a concern. Fitzgerald caught his only preseason target for six yards. Fitzgerald suggested he may continue playing beyond 2018, Jace Frederick of The St. Paul Pioneer Press reports. "It doesn't really matter about the age, it's about what you put into it and your mind-set," Fitzgerald said. "If you still produce and you play at a high level, you kind of determine how long you want to play. If I can stay at a high level, I still keep destiny in my own hands." Fitzgerald will be working with quarterback Sam Bradford in 2018 after the latter signed with the Cardinals on Friday. Fitzgerald will return to the Cardinals for his 15th NFL season in 2018, Darren Urban of the Cardinals' official site reports. Fitzgerald's $11 million salary for 2018 became guaranteed Friday, Kent Somers of The Arizona Republic reports. Analysis: Though Fitzgerald remains on the Arizona roster, the guaranteed salary doesn't affect his decision regarding retirement, which the 34-year-old continues to contemplate. It's expected that Fitzgerald will announce his intentions for 2018 later this month, but if he chooses to walk away from the game, he would forfeit the $11 million he's owed. Fitzgerald said Sunday that he'll make a decision on his future "in a week or two," Mike Garafolo of NFL Network reports. Fitzgerald hasn't made a decision on whether to play in 2018, Jeremy Bergman of NFL.com reports. "I spoke with Larry," new Cardinals head coach Steve Wilks said Tuesday. "We had a very in-depth conversation. I enjoyed the conversation he and I had. He did not express he was or wasn't coming back, but we would definitely love to have him back." 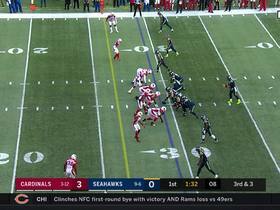 Fitzgerald corralled eight of 13 passes for 55 yards during Sunday's 26-24 win at Seattle. Fitzgerald racked up nine catches (on 15 targets) for 119 yards and one touchdown during Sunday's 23-0 win against the Giants. Fitzgerald caught five of his 10 targets for 60 yards in Sunday's 20-15 loss to the Redskins. Analysis: Fitzgerald was the leading receiver, but Arizona's passing game struggled on the whole, as quarterback Blaine Gabbert threw for 189 yards on 41 attempts while also taking five sacks. Still, Fitzgerald was almost able to set his team up for the game-winning touchdown in the final minute before a hit knocked the ball out of his hands on a fourth-down play. Even with his team's less-than-ideal quarterback situation, Fitzgerald remains a hot fantasy commodity thanks to his massive share of targets. Fitzgerald secured five of seven targets for 44 yards during Sunday's 12-7 victory against the Titans. Fitzgerald caught all 10 balls thrown his way for 98 yards and a touchdown during Sunday's 32-16 loss to the Rams. Fitzgerald caught three of eight targets for 12 yards in Sunday's 27-24 win over the Jaguars. Analysis: After catching 19 passes the previous two weeks, Fitzgerald was completely shut down in a nightmare matchup. He should bounce back in Week 13, at least to some extent, though he'll have to contend with a Rams defense that held him to three catches for 29 yards in a 33-0 loss back in Week 7. Fitzgerald snagged nine of 10 targets for 91 yards and a touchdown during Sunday's 31-21 loss to the Texans. Fitzgerald's decision to sign a one-year extension doesn't necessarily mean he'll play in 2018, ESPN.com's Josh Weinfuss reports. Analysis: The one-year, $11 million deal, which includes a no-trade clause, simply ensures that Fitzgerald will stay in Arizona if he does indeed continue his career. It also hints that he plans to do so, but he could still opt for retirement in the offseason. As for the more immediate future, Sunday brings a road matchup against a Houston defense that has surrendered three straight 300-yard passing games. Blaine Gabbert will start at quarterback and may prove to be an upgrade from Drew Stanton (knee). Fitzgerald and the Cardinals agreed Friday to a one-year contract extension, keeping the wideout in Arizona through the 2018 campaign, Darren Urban of the Cardinals' official site reports. According to Mike Jurecki of Arizona Sports 98.7 FM, the deal includes a no-trade clause and is worth $11 million, the same salary figure that Fitzgerald received in 2016 and 2017. Fitzgerald is closing in on an extension with the Cardinals through the 2018 season, Kent Somers of The Arizona Republic reports. Analysis: Fitzgerald's previous contract included an extension through the current campaign and a voidable year in 2018, the latter of which was intended to aid with management of the salary cap. Neither party has confirmed details of the contract, but the wide receiver will soon commit to a 15th season with the Cardinals. Fitzgerald brought in 10 of 14 targets for 113 yards in Thursday's 22-16 loss to the Seahawks. Fitzgerald brought in five of nine targets for 70 yards in Sunday's 20-10 win over the 49ers.